The liver is one of the most important organs in the human body. Weighing around one kilogram, the liver works 24 hours a day to produce and process many of the chemicals the body requires. It processes almost everything you eat, drink, or breathe, performing over 500 different functions. These functions include hormone production, bile secretion, and conversion of sugars into glycogen. Our modern lifestyle can put a significant amount of strain on the liver through the exposure to pollution, toxins, and a wide range of chemicals. Considering that the liver is under constant stress, it is important to help support and maximize liver health and function. Liver Rescue is a formula designed to do just that—support and maximize the performance of a healthy liver. It contains a novel combination of 7 ingredients to support the liver in a number of ways. From ingredients that fight free radicals to others that improve bile production, Liver Rescue gives your liver the support it deserves. DIRECTIONS Adults take two capsules daily or as directed by a health care practitioner. If seal around cap is broken, do not use. WARNINGS Consult a health care practitioner prior to use if you have any specific medical condition, or are taking any prescreiption medications. Do not use if you have a bile duct obstrucion. Consult a health care practitioner if symptoms persist or worsen. Taking Bel Marra’s Liver Rescue gives me peace of mind, knowing my liver is getting support. I have been using the Liver Rescue formula for 4 weeks. I was quite surprised at the difference they make. I feel great! 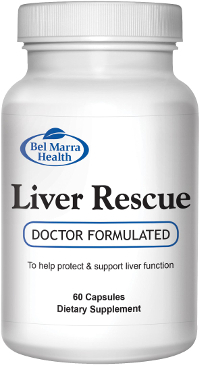 I started using Bel Marra Liver Rescue as recommended by a friend a little over a month ago. I think this is a fantastic product and will continue to use it. Liver Rescue has helped give me an overall feeling of good health. Noticed the difference after I started taking the product.